This graph illustrates the three phases that have defined the RIPE community’s journey to IPv6 deployment since 1999. (Click to Enlarge)In the previous graph and article published here two weeks ago, we showed that many ISPs in the RIPE NCC service region (Europe, the Middle East and parts of Central Asia) have not yet obtained IPv6 addresses from the RIPE NCC. Our latest graph demonstrates just how quickly this is changing. During the experimental phase allocations were made sporadically. During this phase there was a steady flow of requests from early adopters. 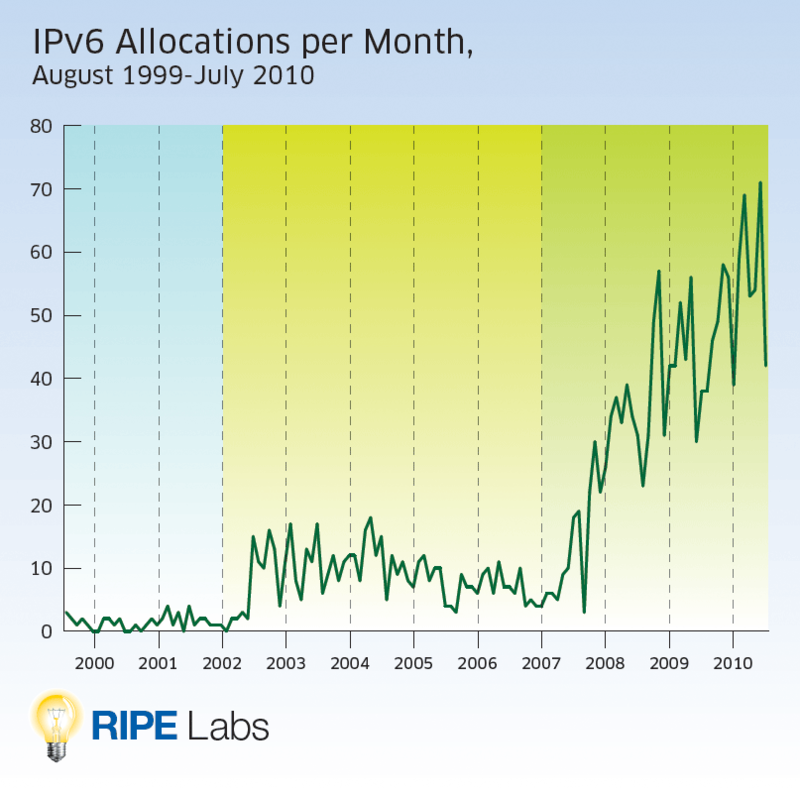 Since 2007 we have witnessed a growing number of IPv6 allocation requests. More and more ISPs are obtaining IPv6 addresses at present, which is very encouraging. It is essential that all organisations worldwide will deploy IPv6 quickly enough to ensure the sustainable growth of the Internet. Read more about this graph on the RIPE Labs site. Local Time: Thursday, April 18, 2019 08:00 PM PDT – Page Load: 0.2640 Sec.